Thanks to IKEA for collaborating on this project. I have been wanting to replace the dresser and side table that I have been using as nightstands for quite some time. 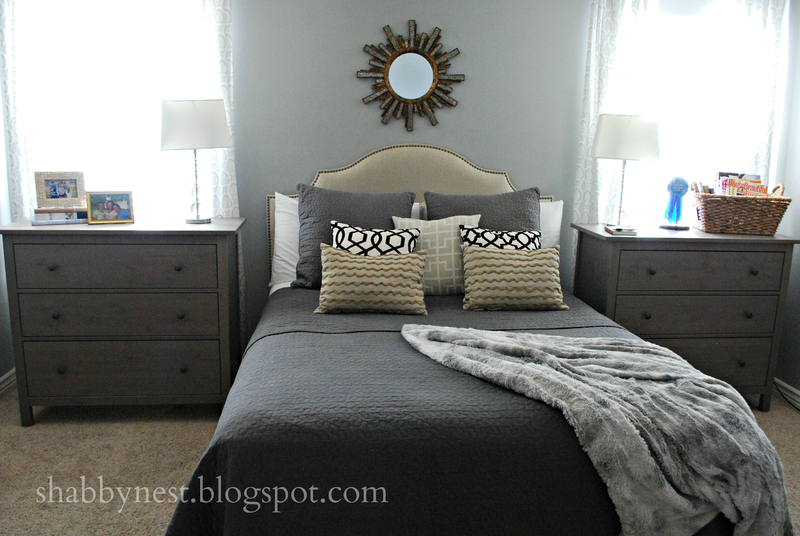 Aside from the fact that I wasn't happy with the way they looked (so unhappy, in fact, that I have no pictures showing both sides of the bed at the same time), I also really wanted a more symmetrical look and I needed increased storage in my bedroom. My bedroom is also my office, and since I have a small desk with very little storage, I thought adding more storage for office supplies would be beneficial, and using a dresser in place of a nightstand was the perfect idea. 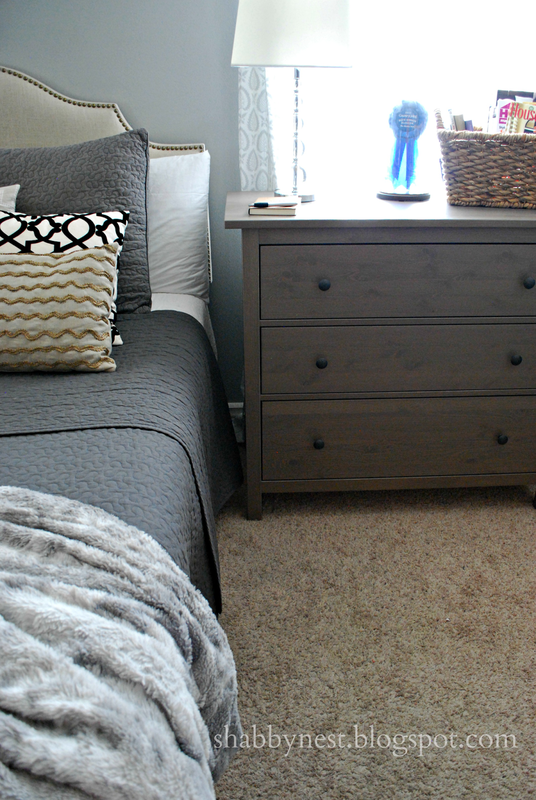 I decided on the Hemnes 3-drawer dressers from IKEA because I like the clean, simple lines and the gray-brown color was perfect with the palette I already have going in my bedroom. The deep drawers offer tons of storage. On one side of my bed, I keep craft supplies and wrapping paper supplies. 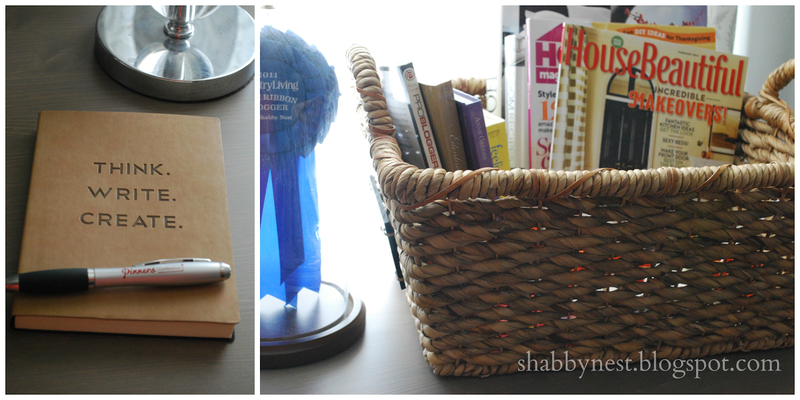 On the other side - closer to my desk - I keep my printer, camera, and other blogging supplies. I can just pull out the drawer with the printer, plug it into the computer and into an electrical outlet, and I can print without even taking it out of the drawer. I'm extremely happy with how the room looks and more importantly, how it functions. It's a win/win. I was given the IKEA dressers in exchange for a review, but the opinions posted are 100% mine. I love IKEA! 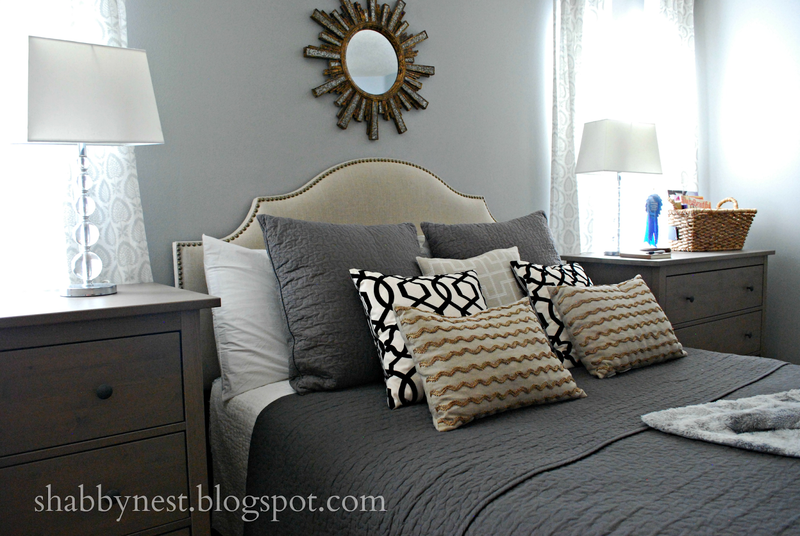 The dressers look gorgeous and I love the idea of having all that storage! Your room looks very beautiful and I like the look but I am always a little disappointed with how the furniture from IKEA (and other flat pack suppliers) lasts. I'd love to see what you think in a year or more's time. I do love the idea of dressers as bedside tables. We don't have a big wardrobe and so we have quite big bedside tables that we store some of our clothes in. I could even go bigger. Love this idea! Those drawers are perfect for the space too!